NAIROBI and HARARE, Oct 21 2015 (IPS) - Kenya has made tremendous steps towards ensuring that the elderly population does not slide into extreme poverty, hunger and, consequently, premature death. This comes amidst concerns that due to the breakdown of socio-cultural safety nets, Africa’s senior citizens aged 60 years and above are often falling deeper and deeper into poverty and destitution. Government estimates places the number of Kenyans aged over 60 years at two million out of a total population of 45 million people. Beatrice Akoth, a social worker working with the needy in Nairobi told IPS that a vast majority of the elderly are often fragile, poor and emotionally vulnerable needing care and support. “Many of us are guardians caring for HIV/AIDS orphans, some like myself are HIV positive,” said Diana Ingosi, a beneficiary living in the Kibera slums. Against this backdrop and in line with the country’s National Policy on Older Persons and Ageing 2009 and the Kenya Social Protection Policy 2011, Kenya has developed a cash transfer programme as social protection that serves the non pensionable and aged Kenyans who are not formally employed. The programme targets those aged 65 and over who have no pension or any source of income whatsoever. They also must prove that they are the poorest of the poor to receive some 20 dollars at the end of each month. Previously, the government’s social protection of the elderly was through social security for those in formal employment, particularly through the National Social Security Fund, leaving those in the formal sector unprotected. Government statistics show that some 59,000 senior citizens are benefitting from the cash transfer programme but the numbers are expected to rise to at least 164,000 or a minimum of 523 people in each of the country’s 290 constituencies. “The government also says there is a plan to increase the stipend since 20 dollars is still not enough,” said Akoth. The World Bank’s report titled The State of Social Safety Nets 2015 shows that while most developing countries spend an average of 1.6 per cent of their GDP on social safety nets, Kenya spends close to 3 per cent of its GDP on social nets targeting the elderly, those with disability as well as the orphaned and vulnerable children. This has placed this East African nation among seven sub-Saharan Africa countries showing the way in providing safety nets for its ageing population. Others are Sierra Leone, Burundi, South Africa, Mauritius and Namibia, with Kenya coming in at number seven. Yet in spite of the government’s demonstrated commitment, fears are rife that the safety nets might not hold. Though the cash transfer service was revolutionary and would change, even save lives, Akoth said that there is no middle man between the community and the government. “Someone has to find these elderly people and register them. Once approved, someone has to go back to them to inform them that the money has been sent to the bank for collection,” Akoth observed. She says that with some of them being sick and immobile, having someone collect the money on their behalf is difficult since only the person whose signature appears can collect the money from appointed banks. “As a result, substantial amounts of money remain in the bank uncollected and have to be returned to the government,” said Akoth. But Kenya is not the only one facing these hurdles. The global population of people aged 60 years and older is set to double from 542 million in 1995 to 1.2 billion in 2025, based on the World Health Organisation’s findings last year. Here in Southern Africa, Zimbabwe has close to 800,000 older persons, according to the Centre for Community Development Solutions, an organisation that coordinates the National Age Network of Zimbabwe, with 64 per cent of them living in poverty both in rural and urban areas, based on statistics from the Zimbabwe National Statistics Agency. “The failure by older persons to participate in mainstream economic issues has denied them the opportunity to move themselves out of the murky waters of poverty,” Conrad Gweru, Advocacy and Communications Officer for the CCDS, told IPS. Such is the case with many of Zimbabwe’s senior citizens like 74 year old Senzeni Dube, who lives in Bulawayo, the country’s second largest city. “I’m poor because so far I have sold everything I owned to take care of my orphaned grandchildren and here in Zimbabwe there is very little government commitment to assist people like me,” Dube told IPS. Last year while speaking at the belated commemorations to mark the United Nations Elder Persons Day, Jonathan Mandaza, chairperson of the Zimbabwe Older Persons Organization, said abuse of the elderly in Zimbabwe is rampant, adding that it included neglect by the government. Continentally, Global Ageing estimates that by 2050, the number of people over 60 living in Africa will increase from just under 50 million to just under 200 million, with Northern and Southern Africa being the most rapidly ageing regions on the continent. Global Ageing is a campaign to bring the issue of world ageing and its effects on global development cooperation to public attention. 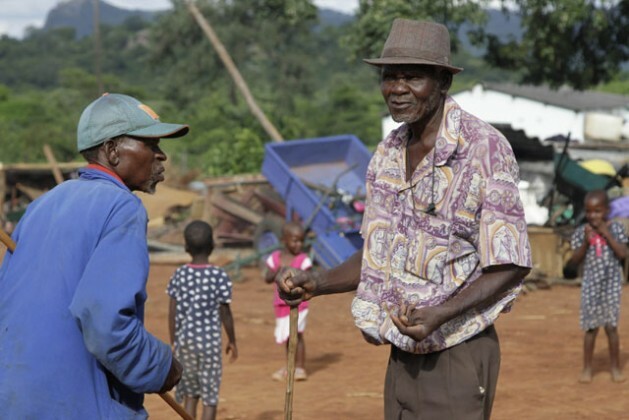 Local development experts agree poverty rules the roost among Africa’s aged persons. “Many older people live in rural areas with fewer services, exposing the aged to economic and social exclusion, thanks to age discrimination while literacy rates among older people – mostly older women – remain low,” Letwin Ngondo, an independent development expert based in Zimbabwe, told IPS. Ngondo’s assessment is also true about Tanzania, where old age benefits do not exist, with nearly two million elderly people there living in poverty. However, a protocol to the African Charter on Human and Peoples’ Rights has been developed on the rights of older people and is currently going through the process of adoption by the African Union. The yet-to-be ratified charter outlines African governments’ specific human rights obligations to older people and would require governments here to introduce legislation and policies to protect rights in older age.